This is Part III of a series of articles on Translational Medicine in water transport or paracellelar flow, and ion conductance. The first article was solely on the aquaporins (Part I), and the second goes from paracellular flow (dealing with paracellin-1 and the familay of claudins. These proteins factor into a number of diseases of kidney function and Mg(2+) homeostasis, as well as a relationship between congestive heart failure related to infarct remodeling and the sodium-calcium transporter, with a model for treatment (Part II). The last explores the basis of selective ion conduction, based on the 2003 Nobel Prize presentation by Roderick MacKinnon (Part III). Water is an electrically polarizable substance, which means that its molecules rearrange in an ion’s electric field, pointing negative oxygen atoms in the direction of cations and positive hydrogen atoms toward anions. These electrically stabilizing interac­tions are much weaker in a less polarizable substance such as oil. Thus, an ion will tend to stay in the water on either side of a cell membrane rather than en­ter and cross the membrane. And yet numerous cellular processes, ranging from electrolyte transport across epithelia to electrical signal production in neurons, depend on the flow of ions across the membrane. To mediate the flow, specific protein catalysts known as ion channels exist in the cell mem­brane. Ion channels exhibit the following three essential properties: (1) they conduct ions rapidly, (2) many ion channels are highly selective, meaning only certain ion species flow while others are excluded, (3) their function is regu­lated by processes known as gating, that is, ion conduction is turned on and off in response to specific environmental stimuli. Figure 1 summarizes these properties (figure 1). Figure 1. Ion channels exhibit three basic properties depicted in the cartoon. They conduct speciﬁc ions (for example K ) at high rates, they are selective (a K channel essentially excludes Na ), and conduction is turned on and off by opening and closing a gate, which can be regulated by an external stimulus such as ligand-binding or membrane voltage. The relative size of K and Naions is shown. The modern history of ion channels began in 1952 when Hodgkin and Huxley published their seminal papers on the theory of the action potential in the squid giant axon (Hodgkin and Huxley, 1952a; Hodgkin and Huxley, 1952b; Hodgkin and Huxley, 1952c; Hodgkin and Huxley, 1952d). A funda­mental element of their theory was that the axon membrane undergoes changes in its permeability to Na+ and K+ ions. The Hodgkin-Huxley theory did not address the mechanism by which the membrane permeability changes occur: ions could potentially cross the membrane through channels or by a carrier-mediated mechanism. In their words ‘Details of the mecha­nism will probably not be settled for some time’ (Hodgkin and Huxley, 1952a). It is fair to say that the pursuit of this statement has accounted for much ion channel research over the past fifty years. As early as 1955 experimental evidence for channel mediated ion flow was obtained when Hodgkin and Keynes measured the directional flow of K+ ions across axon membranes using the isotope 42K+ (Hodgkin and Keynes, 1955). They observed that K+ flow in one direction across the membrane depends on flow in the opposite direction, and suggested that ‘the ions should be con­strained to move in single file and that there should, on average, be several ions in a channel at any moment’. 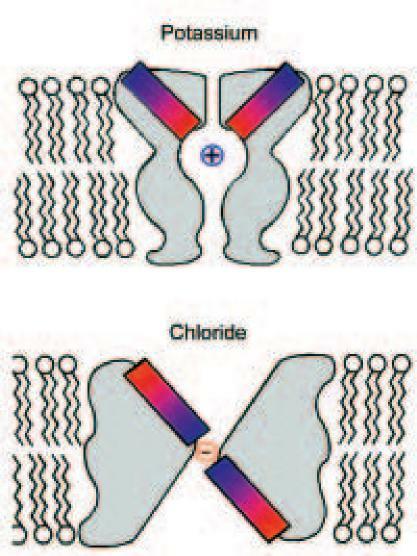 Over the following two decades Armstrong and Hille used electrophysiological methods to demonstrate that Na+ and K+ ions cross cell membranes through unique protein pores – Na+ channels and K+ channels – and developed the concepts of selectivity filter for ion discrim­ination and gate for regulating ion flow (Hille, 1970; Hille, 1971; Hille, 1973; Armstrong, 1971; Armstrong et al., 1973; Armstrong and Bezanilla, 1977; Armstrong, 1981). The patch recording technique invented by Neher and Sakmann then revealed the electrical signals from individual ion channels, as well as the extraordinary diversity of ion channels in living cells throughout nature (Neher and Sakmann, 1976). The past twenty years have been the era of molecular biology for ion chan­nels. The ability to manipulate amino acid sequences and express ion chan­nels at high levels opened up entirely new possibilities for analysis. The ad­vancement of techniques for protein structure determination and the devel­opment of synchrotron facilities also created new possibilities. For me, a sci­entist who became fascinated with understanding the atomic basis of life’s electrical system, there could not have been a more opportune time to enter the field. The past twenty years have been the era of molecular biology for ion channels. The ability to manipulate amino acid sequences and express ion channels at high levels opened up entirely new possibilities for analysis. The advancement of techniques for protein structure determination and the development of synchrotron facilities also created new possibilities. For me, a scientist who became fascinated with understanding the atomic basis of life’s electrical system, there could not have been a more opportune time to enter the ﬁeld. The cloning of the Shaker K+ channel gene from Drosophila melanogaster by Jan, Tanouye, and Pongs revealed for the first time a K+ channel amino acid se­quence and stimulated efforts by many laboratories to discover which of these amino acids form the pore, selectivity filter, and gate (Tempel et al., 1987; Kamb et al., 1987; Pongs et al., 1988). At Brandeis University in Chris Miller’s laboratory I had an approach to find the pore amino acids. Chris and I had just completed a study showing that charybdotoxin, a small protein from scor­pion venom, inhibits a K+ channel isolated from skeletal muscle cells by plug­ging the pore and obstructing the flow of ions (MacKinnon and Miller, 1988). In one of those late night ‘let’s see what happens if’ experiments while taking a molecular biology course at Cold Spring Harbor I found that the toxin – or what turned out to be a variant of it present in the charybdotoxin prepara­tion – inhibited the Shaker K+ channel (MacKinnon et al., 1988; Garcia et al., 1994). This observation meant I could use the toxin to find the pore, and it did not take very long to identify the first site-directed mutants of the Shaker K+ channel with altered binding of toxin (MacKinnon and Miller, 1989). I continued these experiments at Harvard Medical School where I began as as­sistant professor in 1989. Working with my small group at Harvard, including Tatiana Abramson, Lise Heginbotham, and Zhe Lu, and sometimes with Gary Yellen at Johns Hopkins University, we reached several interesting conclusions concerning the architecture of K+ channels. They had to be tetramers in which four subunits encircle a central ion pathway (MacKinnon, 1991). This conclusion was not terribly surprising but the experiments and analysis to reach it gave me great pleasure since they required only simple measure­ments and clear reasoning with binomial statistics. We also deduced that each subunit presents a ‘pore loop’ to the central ion pathway (figure 2) (MacKinnon, 1995). Figure 2. Early picture of a tetramer K+ channel with a selectivity filter made of pore loops. A linear representation of a Shaker K+ channel subunit on top shows shaded hydrophobic segments S1 to S6 and a region designated the pore loop. A partial amino acid sequence from the Shaker K+ channel pore loop highlights amino acids shown to interact with ex-tracellular scorpion toxins (*), intracellular tetraethylammonium (↑) and K+ ions (+). The pore loop was proposed to reach into the membrane (middle) and form a selectivity filter at the center of four subunits (bottom). This ‘loop’ formed the binding sites for scorpion toxins (MacKinnon and Miller, 1989; Hidalgo and MacKinnon, 1995; Ranganathan et al., 1996) as well as the small-molecule inhibitor tetraethylammonium ion (MacKinnon and Yellen, 1990; Yellen et al., 1991), which had been used by Armstrong and Hille decades earlier in their pioneering analysis of K+ channels (Armstrong, 1971; Armstrong and Hille, 1972). Most important to my thinking, mutations of certain amino acids within the ‘loop’ affected the channel’s ability to discriminate between K+ and Na+, the selectivity hallmark of K+ channels (Heginbotham et al., 1992; Heginbotham et al., 1994). Meanwhile, new K+ channel genes were discovered and they all had one ob­vious feature in common: the very amino acids that we had found to be im­portant for K+ selectivity were conserved (figure 3). We called these amino acids the K+ channel signature sequence, and imagined four pore loops somehow forming a selectivity filter with the signature sequence amino acids inside the pore (Heginbotham et al., 1994; MacKinnon, 1995). Figure 3. The K+ channel signature sequence shown as single letter amino acid code (blue) is highly conserved in organisms throughout the tree of life. Some K+ channels contain six membrane-spanning segments per subunit (6TM) while others contain only two (2TM). 2TM K+ channels correspond to 6TM K+ channels without the first four membrane-span­ning segments (S1-S4 in figure 2). When you consider the single channel conductance of many K+ channels found in cells you realize just how incredible these molecular devices are. With typical cellular electrochemical gradients, K+ ions conduct at a rate of 107 to 108 ions per second. That rate approaches the expected collision fre­quency of K+ ions from solution with the entryway to the pore. This means that K+ ions flow through the pore almost as fast as they diffuse up to it. For this to occur the energetic barriers in the channel have to be very low, some­thing like those encountered by K+ ions diffusing through water. All the more remarkable, the high rates are achieved in the setting of exquisite selectivity: the K+ channel conducts K+, a monovalent cation of Pauling radius 1.33 Å, while essentially excluding Na+, a monovalent cation of Pauling radius 0.95 Å. And this ion selectivity is critical to the survival of a cell. How does nature ac­complish high conduction rates and high selectivity at the same time? The an­swer to this question would require knowing the atomic structure formed by the signature sequence amino acids, that much was clear. The conservation of the signature sequence amino acids in K+ channels throughout the tree of life, from bacteria (Milkman, 1994) to higher eukaryotic cells, implied that nature had settled upon a very special solution to achieve rapid, selective K+ conduction across the cell membrane. For me, this realization provided in­spiration to want to directly visualize a K+ channel and its selectivity filter. I did not know how we would ever reach the point of ob­taining enough K+ channel protein to attempt crystallization, but the K+ channel signature sequence continued to appear in a growing number of prokaryotic genes, making expression in Escherichia coli possible. We focused our effort on a bacterial K+ channel called KcsA from Streptomyces lividans, dis­covered by Schrempf (Schrempf et al., 1995). 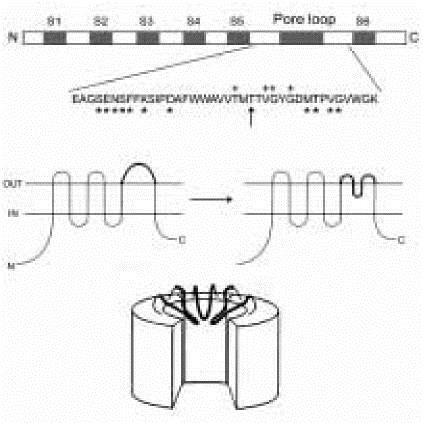 The KcsA channel has a simple topology with only two membrane spanning segments per subunit corre­sponding to the Shaker K+ channel without S1 through S4 (figure 2). Despite its prokaryotic origin KcsA closely resembled the Shaker K+ channel’s pore amino acid sequence, and even exhibited many of its pharmacological prop­erties, including inhibition by scorpion toxins (MacKinnon et al., 1998). This surprised us from an evolutionary standpoint, because why should a scorpion want to inhibit a bacterial K+ channel! But from the utilitarian point of view of protein biophysicists we knew exactly what the scorpion toxin sensitivity meant, that KcsA had to be very similar in structure to the Shaker K+ channel. The KcsA channel produced crystals but they were poorly ordered and not very useful in the X-ray beam. After we struggled for quite a while I began to wonder whether some part of the channel was intrinsically disordered and in­terfering with crystallization. Fortunately my neighbor Brian Chait and his postdoctoral colleague Steve Cohen were experts in the analysis of soluble proteins by limited proteolysis and mass spectrometry, and their techniques applied beautifully to a membrane protein. We found that KcsA was as solid as a rock, except for its C-terminus. After removing disordered amino acids from the c-terminus with chymotrypsin the crystals improved dramatically, and we were able to solve an initial structure at a resolution of 3.2 Å (Doyle et al., 1998). We could not clearly see K+ in the pore at this resolution, but my years of work on K+ channel function told me that Rb+ and Cs+ should be valuable electron dense substitutes for K+, and they were. Rubidium and Cs+ difference Fourier maps showed these ions lined up in the pore – as Hodgkin and Keynes might have imagined in 1955 (Hodgkin and Keynes, 1955). The KcsA structure was altogether illuminating, but before I describe it, I will depart from chronology to explain the next important technical step. A very accurate description of the ion coordination chemistry inside the selec­tivity filter would require a higher resolution structure. With 3.2 Å data we could infer the positions of the main-chain carbonyl oxygen atoms by apply­ing our knowledge of small molecule structures, that is our intu­ition, but we needed to see the selectivity filter atoms in detail. A high-resolu­tion structure was actually quite difficult to obtain. After more than three ad­ditional years of work by João and then Yufeng (Fenny) Zhou we finally man­aged to produce high-quality crystals by attaching monoclonal Fab fragments to KcsA. 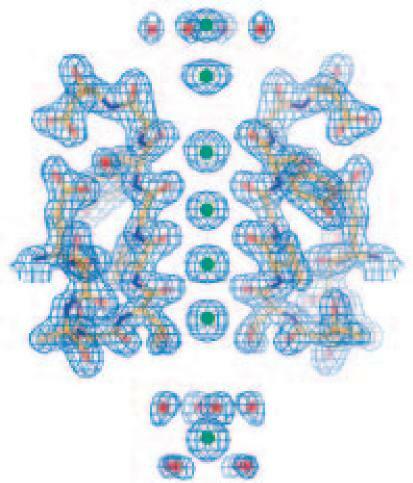 These crystals provided the information we needed, a structure at a resolution of 2.0 Å in which K+ ions could be visualized in the grasp of selectivity filter protein atoms (figure 4) (Zhou et al., 2001b). What did the K+ channel structure tell us and why did nature conserve the K+ channel signa­ture sequence amino acids? Figure 4. Electron density (2Fo-Fc contoured at 2 ir) from a high-resolution structure of the KcsA K+ channel is shown as blue mesh. This region of the channel features the selectivity filter with K+ ions and water molecules along the ion pathway. The refined atomic model is shown in the electron density. Adapted from (Zhou et al., 2001b). Not all protein structures speak to you in an understandable language, but the KcsA K+ channel does. Four subunits surround a central ion pathway that crosses the membrane (figure 5A). Two of the four subunits are shown in fig­ure 5B with electron density from K+ ions and water along the pore. Near the center of the membrane the ion pathway is very wide, forming a cavity about 10 Å in diameter with a hydrated K+ ion at its center. Each subunit directs the C-terminal end of a ‘pore helix’, shown in red, toward the ion. The C-termi­nal end of an á-helix is associated with a negative ‘end charge’ due to car­bonyl oxygen atoms that do not participate in secondary structure hydrogen bonding, so the pore helices are directed as if to stabilize the K+ ion in the cavity. At the beginning of this lecture I raised the fundamental issue of the cell membrane being an energetic barrier to ion flow because of its oily inte­rior. KcsA allows us to intuit a simple logic encoded in its structure, and elec­trostatic calculations support the intuition (Roux and MacKinnon, 1999): the K+ channel lowers the membrane dielectric barrier by hydrating a K+ ion deep inside the membrane, and by stabilizing it with á-helix end charges. How does the K+ channel distinguish K+ from Na+? Our earlier mutagene-sis studies had indicated that the signature sequence amino acids would be re­sponsible for this most basic function of a K+ channel. Figure 6 shows the structure formed by the signature sequence – the selectivity filter – located in the extracellular third of the ion pathway. The glycine amino acids in the se­quence TVGYG have dihedral angles in or near the left-handed helical region of the Ramachandran plot, as does the threonine, allowing the main-chain carbonyl oxygen atoms to point in one direction, toward the ions along the pore. It is easy to understand why this sequence is so conserved among K+ channels: the alternating glycine amino acids permit the required dihedral angles, the threonine hydroxyl oxygen atom coordinates a K+ ion, and the side-chains of valine and tyrosine are directed into the protein core sur­rounding the filter to impose geometric constraint. Figure 6. Detailed structure of the K+ selectivity filter (two subunits). Oxygen atoms coordi­nate K+ ions (green spheres) at positions 1 to 4 from the extracellular side. Single letter amino acid code identifies select signature sequence amino acids. Yellow, blue and red cor­respond to carbon, nitrogen and oxygen atoms, respectively. Green and gray dashed lines show oxygen-K+ and hydrogen bonding interactions. 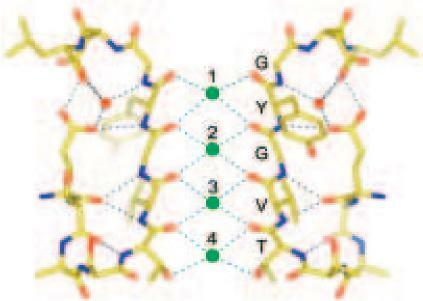 The end result when the subunits come together is a narrow tube consisting of four equal spaced K+ binding sites, labeled 1 to 4 from the extracellular side. Each binding site is a cage formed by eight oxygen atoms on the vertices of a cube, or a twisted cube called a square antiprism (figure 7). The binding sites are very similar to the single alkali metal site in nonactin, a K+ selective antibiotic with nearly identical K+-oxygen distances (Dobler et al., 1969; Dunitz and Dobler, 1977). The principle of K+ selectivity is implied in a subtle feature of the KcsA crystal structure. The oxygen atoms surrounding K+ ions in the selectivity filter are arranged quite like the water molecules surrounding the hydrated K+ ion in the cavity. This comparison conveys a visual impression of binding sites in the filter paying for the energetic cost of K+ dehydration. 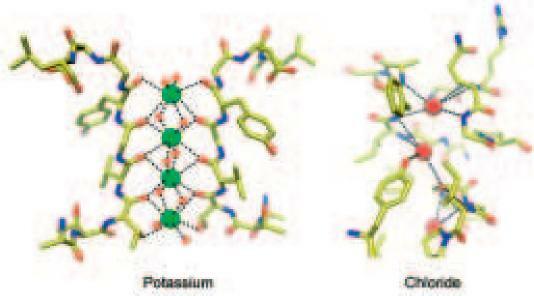 The Na+ ion is appar­ently too small for these K+-sized binding sites, so its dehydration energy is not compensated. Figure 7. A K+ channel mimics the hydration shell surrounding a K+ ion. Electron density (blue mesh) for K+ ions in the filter and for a K+ ion and water molecules in the central cav­ity are shown. White lines highlight the coordination geometry of K+ in the filter and in wa­ter. Adapted from (Zhou et al., 2001b). The question that compelled us most after seeing the structure was exactly how many ions are in the selectivity filter at a given time? To begin to under­stand how ions move through the filter we needed to know the stoichiometry of the ion conduction reaction, and that meant knowing how many ions can occupy the filter. Four binding sites were apparent, but are they all occupied at once? Four K+ ions in a row separated by an average center-to-center dis­tance of 3.3 Å seemed unlikely for electrostatic reasons. From an early stage we suspected that the correct number would be closer to two, because two ions more easily explained the electron density we observed for the larger al­kali metal cations Rb+ and Cs+ (Doyle et al., 1998; Morais-Cabral et al., 2001). Quantitative evidence for the precise number of ions came with the high-res­olution structure and with the analysis of Tl+ (Zhou and MacKinnon, 2003). Thallium is the most ideally suited ‘K+ analog’ because it flows through K+ channels, has a radius and dehydration energy very close to K+, and has the favorable crystallographic attributes of high electron density and an anom­alous signal. The one serious difficulty in working with Tl+ is its insolubility with Cl–. Fenny meticulously worked out the experimental conditions and de­termined that on average there are between two and two and a half conduct­ing ions in the filter at once, with an occupancy at each position around one half. We also observed that if the concentration of K+ (or Tl+) bathing the crys­tals is lowered sufficiently (below normal intracellular levels) then a reduc­tion in the number of ions from two to one occurs and is associated with a structural change to a ‘collapsed’ filter conformation, which is pinched closed in the middle (Zhou et al., 2001b; Zhou and MacKinnon, 2003). At concentrations above 20 mM the entry of a second K+ ion drives the filter to a ‘conductive’ conformation, as shown in figure 8. Sodium on the other hand does not drive the filter to a ‘conductive’ conformation even at concentra­tions up to 500 mM. Figure 8. The selectivity filter can adopt two conformations. At low concentrations of K+ on average one K+ ion resides at either of two sites near the ends of the filter, which is col­lapsed in the middle. At high concentrations of K+ a second ion enters the filter as it changes to a conductive conformation. On average, two K+ ions in the conductive filter re­side at four sites, each with about half occupancy. The K+-induced conformational change has thermodynamic consequences for the affinity of two K+ ions in the ‘conductive’ filter. It implies that a frac­tion of the second ion’s binding energy must be expended as work to bring about the filter’s conformational change, and as a result the two ions will bind with reduced affinity. To understand this statement at an intuitive level, rec­ognize that for two ions to reside in the filter they must oppose its tendency to collapse and force one of them out, i.e. the two-ion ‘conductive’ conforma­tion is under some tension, which will tend to lower K+ affinity. This is a de­sirable property for an ion channel because weak binding favors high con­duction rates. The same principle, referred to as the ‘induced fit’ hypothesis, had been proposed decades earlier by enzymologists to explain high speci­ficity with low substrate affinity in enzyme catalysis (Jencks, 1987). In the ‘conductive’ filter if two K+ ions were randomly distributed then they would occupy four sites in six possible ways. But several lines of evidence hint­ed to us that the ion positions are not random. For example Rb+ and Cs+ ex-hibit preferred positions with obviously low occupancy at position 2 (Morais-Cabral et al., 2001; Zhou and MacKinnon, 2003). In K+ we observed an un­usual doublet peak of electron density at the extracellular entryway to the se­lectivity filter, shown in figure 9 (Zhou et al., 2001b). We could explain this density if K+ is attracted from solution by the negative protein surface charge near the entryway and at the same time repelled by K+ ions inside the filter. Two discrete peaks implied two distributions of ions in the filter. Figure 9. Two K+ ions in the selectivity filter are hypothesized to exist predominantly in two specific configurations 1,3 and 2,4 as shown. K+ ions and water molecules are shown as green and red spheres, respectively. Adapted from (Zhou et al., 2001b). Discrete configurations of an ion pair suggested a mechanism for ion con­duction (figure 10A) (Morais-Cabral et al., 2001). The K+ ion pair could dif­fuse back and forth between 1,3 and 2,4 configurations (bottom pathway), or alternatively an ion could enter the filter from one side of the membrane as the ion-water queue moves and a K+ exits at the opposite side (the top path­way). Movements would have to be concerted because the filter is no wider than a K+ ion or water molecule. The two paths complete a cycle: in one com­plete cycle each ion moves only a fraction of the total distance through the fil­ter, but the overall electrical effect is to move one charge all the way. Figure 10. (A) Through-put cycle for K+ conduction invoking 1,3 and 2,4 configurations. The selectivity filter is represented as five square planes of oxygen atoms. K+ and water are shown as green and red spheres, respectively. (B) Simulated K+ flux around the cycle is graphed as a function of the energy difference between the 1,3 and 2,4 configurations. Adapted from (Morais-Cabral et al., 2001). A simulation of ions diffusing around the cycle offers a possible explanation: maximum flux is achieved when the energy difference between the 1,3 and 2,4 configurations is zero because that is the condition under which the ‘energy landscape’ for the con­duction cycle is smoothest (figure 10B). The energetic balance between the configurations therefore might reflect the optimization of conduction rate by natural selection (Morais-Cabral et al., 2001). It is not so easy to demonstrate this point experimentally but it is certainly fascinating to ponder. The focus of this lecture is K+ channels, but for a brief interlude I would like to show you a Cl– selective transport protein. By comparing a K+ channel and a Cl– ‘channel’ we can begin to appreciate familiar themes in nature’s solu­tions to different problems: getting cations and anions across the cell mem­brane. ClC Cl– channels are found in many different cell types and are associ­ated with a number of physiological processes that require Cl– ion flow across lipid membranes (Jentsch et al., 1999; Maduke et al., 2000). As is the case for K+ channels, ClC family genes are abundant in prokaryotes, a fortunate cir­cumstance for protein expression and structural analysis. When Raimund Dutzler joined my laboratory he, Ernest Campbell and I set out to address the structural basis of Cl– ion selectivity. We determined crystal structures of two bacterial members of the ClC Cl– channel family, one from Escherichia coli (EcClC) and another from Salmonella typhimurium (StClC) (Dutzler et al., 2002). Recent studies by Miller on the function of EcClC have shown that it is actually a Cl– – proton exchanger (Accardi and Miller, 2004). We do not yet know why certain members of this family of Cl– transport proteins function as channels and others as exchangers, but the crystal structures are fascinating and give us a view of Cl– selectivity. Architecturally the ClC proteins are unre­lated to K+ channels, but if we focus on the ion pathway certain features are similar (figure 11). Figure 11. The overall architecture of K+ channels and ClC Cl– transport proteins is very dif­ferent but certain general features are similar. One similarity shown here is the use of á-he-lix end charges directed toward the ion pathway. The negative C-terminal end charge (red) points to K+. The positive N-terminal end charge (blue) points to Cl–. As we saw in K+ channels, the ClC proteins have a-helices pointed at the ion pathway, but the direction is reversed with the positive charge of the N-terminus close to Cl–. This makes perfect sense for lowering the dielectric barrier for a Cl– ion. In ClC we see that ions in its selectivity fil­ter tend to be coordinated by main chain protein atoms, with amide nitrogen atoms surrounding Cl– instead of carbonyl oxygen atoms surrounding K+ (figure 12). We also see that both the K+ and Cl– selectivity filters contain multiple close-spaced binding sites and appear to contain more than one ion, perhaps to exploit electrostatic repulsion between ions in the pore. I find these simi­larities fascinating. They tell us that certain basic physical principles are im­portant, such as the use of á-helix end charges to lower the dielectric barrier when ions cross the lipid membrane. channels conduct when called upon by a specific stimulus such as the binding of a ligand or a change in membrane voltage (Hille, 2001). The processes by which ion conduction is turned on are called gating. The con­duction of ions occurs on a time scale that is far too rapid to involve very large protein conformational changes. Figure 12. K+ and Cl– selectivity filters make use of main chain atoms to coordinate ions: car­bonyl oxygen atoms for K+ ions (green spheres) and amide nitrogen atoms for Cl– ions (red spheres). Both filters contain multiple close-spaced ion binding sites. The Cl– selectivity fil­ter is that of a mutant ClC in which a glutamate amino acid was changed to glutamine (Dutzler et al., 2003). In the KcsA K+ channel gating is controlled by intracellular pH and lipid membrane composition, but unfortunately the KcsA channel’s open proba­bility reaches a maximum value of only a few percent in functional assays (Cuello et al., 1998; Heginbotham et al., 1998). 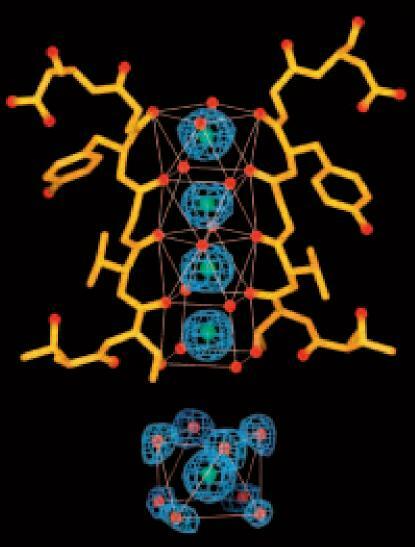 At first we had no definitive way to know whether a gate was open or closed in the crystal structures. In the 1970s Armstrong had proposed the existence of a gate near the intracel­lular side of the membrane in voltage dependent K+ channels because he could ‘trap’ large organic cations inside the pore between a selectivity filter near the extracellular side and a gate near the intracellular side (Armstrong, 1971; Armstrong, 1974). Following these ideas we crystallized KcsA with a heavy atom version of one of his organic cations, tetrabutyl antimony (TBA), and found that it binds inside the central cavity of KcsA (Zhou et al., 2001a). This was very interesting because the ~10 Å diameter of TBA far exceeds the pore diameter leading up to the cavity: in KcsA the intracellular pore entry­way is constricted to about 3.5 Å by the inner helix bundle (figure 5B). Seeing TBA ‘trapped’ in the cavity behind the inner helix bundle evoked Arm-strong’s classical view of K+ channel gating, and implied that the inner helix bundle serves as a gate and is closed in KcsA. Mutational and spectroscopic studies in other laboratories also pointed to the inner helix bundle as a pos­sible gate-forming structural element (Perozo et al., 1999; del Camino et al., 2000). We subsequently determined the crystal structure of MthK, complete K+ channel containing RCK domains, from Methanobacterium thermoautotrophicus (figure 13) (Jiang et al., 2002a). This structure was extremely informative. The RCK domains form a ‘gating ring’ on the intracellular side of the pore. In clefts between domains we could see what appeared to be divalent cation binding sites, and the crys­tals had been grown in the presence of Ca2+. In functional assays we discov­ered that the open probability of the MthK channel increased as Ca2+ or Mg2+ concentration was raised, giving us good reason to believe that the crystal structure should represent the open conformation of a K+ channel. In our MthK structure the inner helix bundle is opened like the aperture of a camera (figure 14) (Jiang et al., 2002b). As a result, the pathway leading up to the selectivity filter from the intracellular side is about 10 Å wide, explaining how Armstrong’s large organic cations can enter the cavity to block a K+ chan-nel, and how K+ ions gain free access to the selectivity filter through aqueous diffusion. By comparing the KcsA and MthK channel structures it seemed that we were looking at examples of closed and opened K+ channels, and could easily imagine the pore undergoing a conformational change from closed to open. In the crystal of KvAP the voltage sen­sors, held by monoclonal Fab fragments, adopted a non-native conformation. This observation in itself is meaningful as it underscores the intrinsic flexibil­ity of voltage sensors: in contrast Fab fragments had little effect on the more rigid KcsA K+ channel and ClC Cl– channel homolog, both of which we deter­mined in the presence and absence of Fab fragments (Doyle et al., 1998; Zhou et al., 2001b; Dutzler et al., 2002; Dutzler et al., 2003). KvAP’s voltage sensors contain a hydrophobic helix-turn-helix element with arginine residues beside the pore (Jiang et al., 2003a). The KvAP structure and associated functional studies have provided a conceptual model for voltage-dependent gating – one in which the voltage sensors move at the protein-lipid interface in response to a balance between hydrophobic and electrostatic forces. Rees and colleagues at the California Institute of Technology determined the structure of a voltage regulated mechanosensitive channel called MscS, and although it is unrelated to traditional voltage-dependent channels, it too con­tains hydrophobic helix-turn-helix elements with arginine residues apparent­ly against the lipid membrane (Bass et al., 2002). MscS and KvAP are fascinat­ing membrane protein structures. They do not fit into the standard category of membrane proteins with rigid hydrophobic walls against the lipid mem­brane core. I find such proteins intriguing. Accardi, A. and Miller, C. (2004) Proton-coupled chloride transport mediated by ClC-ec1, a bacterial homologue of the ClC chloride channels. Biophys.J. 86, 286a. Armstrong, C. M. (1971). Interaction of tetraethylammonium ion derivatives with the potassium channels of giant axons. J. Gen. Physiol. 58, 413–437. Armstrong, C. M. (1981). Sodium channels and gating currents. Physiol. Rev. 61, 645–683. Armstrong, C. M. and Hille, B. (1972). The inner quaternary ammonium ion receptor in potassium channels of the node of Ranvier. J. Gen. Physiol. 59, 388–400. Armstrong, C. M. and Bezanilla, F. (1977). Inactivation of the sodium channel. II. Gating current experiments. J. Gen. Physiol 70, 567–590. Bass, R. B., Strop, P., Barclay, M., and Rees, D. C. (2002). Crystal structure of Escherichia coli MscS, a voltage-modulated and mechanosensitive channel. Science 298, 1582–1587. del Camino, D., Holmgren, M., Liu, Y., and Yellen, G. (2000). Blocker protection in the pore of a voltage-gated K+ channel and its structural implications. Nature 403, 321–325. Doyle, D. A., Morais Cabral, J. H., Pfuetzner, R. A., Kuo, A., Gulbis, J. M., Cohen, S. L., Chait, B. T., and MacKinnon,R. (1998). The structure of the potassium channel: molecular basis of K+ conduction and selectivity. Science 280, 69–77. Dutzler, R., Campbell, E. B., Cadene, M., Chait, B. T., and MacKinnon,R. (2002). X-ray structure of a ClC chloride channel at 3.0 Å reveals the molecular basis of anion selectivity. Nature 415, 287–294. Dutzler, R., Campbell, E. B., and MacKinnon, R. (2003). Gating the selectivity filter in ClC chloride channels. Science 300, 108–112. Garcia, M. L., Garcia-Calvo, M., Hidalgo, P., Lee, A., and MacKinnon, R. (1994). Purification and charaterization of three inhibitors of voltage-dependent K+ channels from Leiurus quinquestriatus var. hebraeus venom. Biochemistry 33, 6834–6839. Gulbis, J. M., Mann, S., and MacKinnon, R. (1999). Structure of a voltage-dependent K+ channel beta subunit. Cell 97, 943–952. Gulbis, J. M., Zhou, M., Mann, S., and MacKinnon, R. (2000). Structure of the cytoplasmic f3 subunit-T1 assembly of voltage-dependent K+ channels. Science 289, 123–127. Heginbotham, L., Abramson, T., and MacKinnon, R. (1992). A functional connection between the pores of distantly related ion channels as revealed by mutant K+ channels. Science 258, 1152–1155. Heginbotham, L., Lu, Z., Abramson, T., and MacKinnon, R. (1994). Mutations in the K+ channel signature sequence. Biophys. J. 66, 1061–1067. Hidalgo, P. and MacKinnon, R. (1995). Revealing the architecture of a K+ channel pore through mutant cycles with a peptide inhibitor. Science 268, 307–310. Hille, B. (1970). Ionic channels in nerve membranes. Prog. Biophys. Mol. Biol. 21, 1–32. Hille, B. (1973). Potassium channels in myelinated nerve. Selective permeability to small cations. J. Gen. Physiol. 61, 669–686. Hille, B. (2001). Ion Channels of Excitable Membranes. (Sunderland, MA: Sinauer Associates, Inc.). Hille, B. (1971). The permeability of the sodium channel to organic cations in myelinated nerve. J. Gen. Physiol. 58, 599–619. Hodgkin, A. L. and Huxley, A. F. (1952a). A quantitative description of membrane current and its application to conduction and excitation in nerve. J. Physiol. 117, 500–544. Hodgkin, A. L. and Huxley, A. F. (1952b). Currents carried by sodium and potassium ions through the membrane of the giant axon of Loligo. J. Physiol. 116, 449–472. Hodgkin, A. L. and Huxley, A. F. (1952c). The components of membrane conductance in the giant axon of Loligo. J. Physiol. 116, 473–496. Hodgkin, A. L. and Huxley, A. F. (1952d). The dual effect of membrane potential on sodium conductance in the giant axon of Loligo. J. Physiol. 116, 497–506. Hodgkin, A. L. and Keynes, R. D. (1955). The potassium permeability of a giant nerve fibre. J. Physiol. (Lond) 128, 61–88. Jencks, W. P. (1987). Catalysis in Chemistry and Enzymology. (Dover Publications, Inc.). Jentsch, T. J., Friedrich, T., Schriever, A., and Yamada, H. (1999). The CLC chloride channel family. Pflugers Arch. 437, 783–795. Jiang, Y., Lee, A., Chen, J., Ruta, V., Cadene, M., Chait, B., and MacKinnon, R. (2003a). X-ray structure of a voltage-dependent K+ channel. Nature 423, 33–41. Jiang, Y., Ruta, V., Chen, J., Lee, A., and MacKinnon, R. (2003b). The principle of gating charge movement in a voltage-dependent K+ channel. Nature 423, 42–48. Jiang, Y., Lee, A., Chen, J., Cadene, M., Chait, B. T., and MacKinnon, R. (2002a). Crystal structure and mechanism of a calcium-gated potassium channel. Nature 417, 515–522. Jiang, Y., Lee, A., Chen, J., Cadene, M., Chait, B. T., and MacKinnon, R. (2002b). 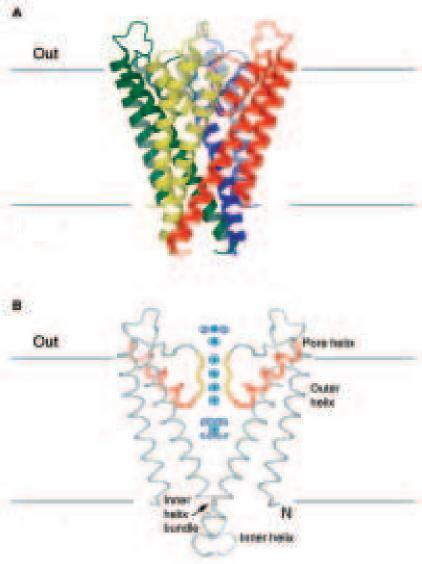 The open pore conformation of potassium channels. Nature 417, 523–526. Jiang, Y., Pico, A., Cadene, M., Chait, B. T., and MacKinnon, R. (2001). Structure of the RCK domain from the E. coli K+ channel and demonstration of its presence in the human BK channel. Neuron 29, 593–601. MacKinnon, R. (1999). The cavity and pore helices in the KcsA K+ channel: electrostatic stabilization of monovalent cations. Science 285, 100–102. Ruta, V., Jiang, Y., Lee, A., Chen, J., and MacKinnon, R. (2003). Functional analysis of an archeabacterial voltage-dependent K+ channel. Nature 422, 180–185. Zhou, M. and MacKinnon, R. (2004). A mutant KcsA K+ channel with altered conduction properties and selectivity filter ion distribution. J.Mol.Biol. 338, 839–846. Zhou, M., Morais-Cabral, J. H., Mann, S., and MacKinnon, R. (2001a). Potassium channel receptor site for the inactivation gate and quaternary amine inhibitors. Nature 411, 657–661. Zhou, Y. and MacKinnon, R. (2003). The occupancy of ions in the K+ selectivity filter: Charge balance and coupling of ion binding to a protein conformational change underlie high conduction rates. J. Mol. Biol. 333, 965–975. Zhou, Y., Morais-Cabral, J. H., Kaufman, A., and MacKinnon, R. (2001b). Chemistry of ion coordination and hydration revealed by a K+ channel- Fab complex at 2.0 Å resolution. Nature 414, 43–48.